Roland CHANCO (1914-2017). Contemporaneous with Picasso, Jen Paul and quite others, Roland CHANCO, who has now 102 years, is still painting. Atypical artist, he destroyed in the middle of his life a great part of his work, saying that « an artist, who doesn’t doubt of himself, is not a real artist ». "Panorama Tatr". Includes sketch labeling Tatr mountain peaks painted in this landscape, photograph of the artist and letters from the artist to Dr. & Mrs. Richard Winter. Vintage Maria Lak painting of a basket with daisies and flowers. Painting measures 4 1/2" x 3 1/2". (11.43cm x 8.89cm) Frame measures 7" by 8". 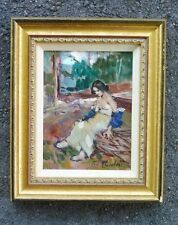 (17.78cm x 20.32cm) Signed M Lak and frame marked Belgium on back. Good condition. Nice Black Americana original oil painting on mason board untitled. Composition appears to be depicting two southern church ladies in Sunday dress sitting amongst a garden of flowers . Impressionist style / folk art . Wood Framed . Signed / Initialed VM. From circa 1950’s. See photos. Paperwork shown will be included. Original one of a kind. Good condition. Max Showalter - 1917 - 2000 - Actor, Composer, Singer. This is a Signed Original Miniature Oil Painting. Research shows that in 1963 (newspaper column) he sold 139 of his Miniature Oil paintings. Signed Lower Left - Circa: 1960`s. Retro Oil Painting On Black Velvet “ELECTRIC COLOR WOODLAND LANDSCAPE” Carved Frame.Calling this painting “Vibrant “ is a understatement.This baby is “Alive” with color! If you need a “Attention Getter” believe me this painting won’t be denied! 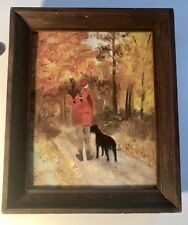 Comes Framed in a nice Carved period frame original to the piece.Painting measures 11” tall by 20” long.Frame measures 22-1/2” Long by 13-1/2” tall.Shipped Carefully Priority Mail large flat rate box insured. The family moved toEl Paso, Texas when Manuel was a child. He started to sketch people and views from El Paso's barrios in a realistic style. Portrait of labor leaderCésar Chávez by 'Manuel Gregorio Acosta', 1969. Before his death in 1991, Dr. Laynor's greatest desire was to provide educational and financial support for visual arts students and educators. His ideas and work provide the beginning structure and focus of the Laynor Foundation Museum. For sale is an original 1960's oil painting by French actor and artist Davos Hanich. If you’re reading this then you probably know who Hanich is, and that he played the lead male role in producer Chris Marker’s 1962 classic French Science Fiction film “La Jetee”. (A black velvet painting velvet painting is a type of painting distinguished by the use of velvet usually black velvet) as the support, in place of canvas, paper, or similar materials. The velvet provides an especially dark background against which colors stand out brightly. Signed Framed Asian Tropical Scene Black Velvet Painting Vintage 25.5 x 48.5"
This seems to be a is this an evening picture of trees, mountains and waterfall on Black Velvet. Nautical Painting. Black Velvet. Chinese Junk Boats. Mid Century Modern. 20x30 org. 1960 watercolor-oil painting: Electra Malone "Texas Black Angus Bull"
On board by a famous international artist from Rockwall Texas: Electra Powers Malone. This painting is a rare big old black happy Angus Bull standing in the middle of the field: with full of character?. 1960 “The Black Americans” Standing on US Map Illustration Art Oil on Board WOW! Calculated Based On Location. Enlarged scans are shown below and this is the exact item(s) you will receive. OIL ON CANVAS. -There is the bulge i n the lower right corner of the canvas. -There are two minor holes on the canvas, visible from very short distance. -The painting has remained untouched, and could use a cleaning. 24x36 original oil painting on board by SELMA WALDMAN "Mother & Child"
Selma Waldman was active/lived in Washington. Selma Waldman is known for painting. Here's an incredible 24x36 oil painting on board of a Mother and Child by a famous artist: Selma Waldman. She was born in Texas and moved to Seattle. Hauntingly beautiful original oil painting of a snowy creek lined with pine trees. Sticker on back reads "paul r. olson art gallery Picture Framing Ventura Boulevard". 69, and is also embedded in the oil paint on the right corner. The colors in this original oil are brilliant! Artist: Henry Kallem. Circa '60s. There is no signature on the front, but the artist's information appears on the reverse side (see photos). Displays nicely. 30" wide x 20" tall. Photo Realist. Randolph Brooks. Oil On Board. Still Life Of Pealed Lemon. THIS WORK IS SIGNED WITH HIS EARLY SIGNATUREWITH THE YEAR 64. THIS PRINT IS IN VERY NICE CONDITION AND HAS NEVER BEEN MOUNTED. Raimond Staprans painting "Diamond Reflection" 28" x 34". Raimonds is 92 and had a wonderful solo show at the San Jose Museum of Art earlier this year. This painting was exhibited at the Maxwell Gallery in San Francisco. Painter Avshalom Okashy was born 1916 in Rishon Le Zion, Israel and died 1980 in Acre. Avshalom Okashi (1916-1980 ). Untilted, 1965. Signed and dated lower right. Israeli Painter. b. 1916, Rishon Le Zion, Israel. 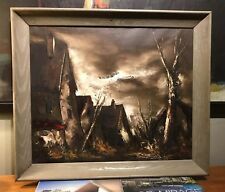 RARE 1963 Original Juan Covas (1927-2017)Oil Painting. ★ ★ ★ RARE Opportunity To Own The Original Juan Covas Painting ★ ★ ★. Signed again, with title on verso. Titled: "Descanso". From Mallorca, Spain. Signed Libermann 60. He is wearing a black coat. Emmy Award Winning, Bill William Alexander Canvas Oil Painting . One of a kind piece. Candle on Black Still Life with Vase in still.36 x 24 Storage lot of several different pieces. Sizes vary. Landscapes, and Stills. Dates back to early 1960’s. You won’t find another one like it. These are considered to be from his personal collection. Signature will be located in left or right corner. Please keep in mind, due to the age, imperfections on canvas are normal, due to handling. There are no rips or tears, unless stated. Each piece is beautiful and unique. Collection of Rare Canvas Paintings. Pair of Vintage Black VELVET Mexican Painti Mexican holding a donkey-MAKE OFFER! They go together as the rope is continued onto the next painting. They could use a cleaning. The owner said they were always like that. They are signed but i cant make out the signatures. I t is n ot obvious exceptd ur in g closeinspection an d doesn ot distract fr om t he painting in t he l ea st.